So now I know the first matter of maintenance on a car is bleeding the brakes. You will find out how well it was taken care of and if your rear brakes work. Mine did not. The culprit turned out to be the bad cylinders above. The adjustment nuts were in bad shape too. 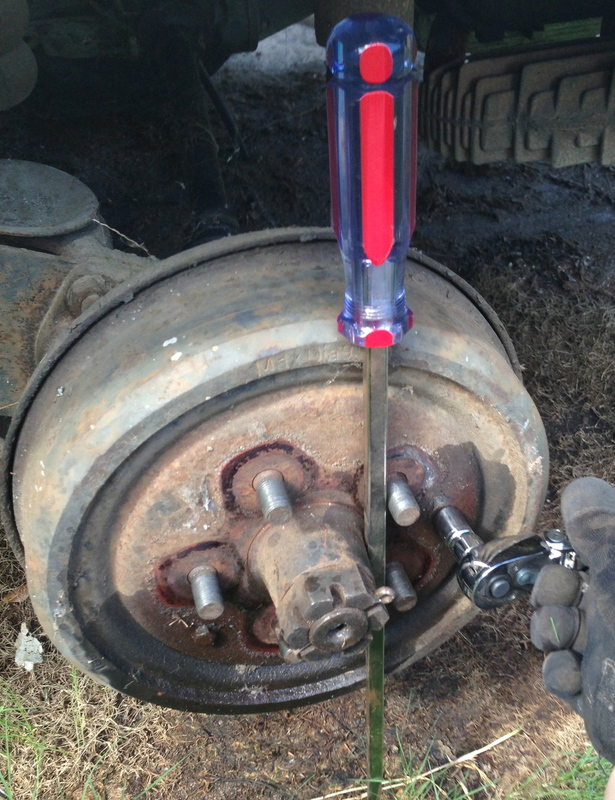 Now the greatest tool in brakes is a very long flathead screwdriver/pry bar. And if your adjustments nuts are seized you might need a puller. I was lucky and just the threat of a puller( even a too small one above) and a disregard for the backing plates got the drums off. Multiple long strong screwdrivers will get those drums off. Another issue with old brakes are the rubber hoses that connect the hard lines going to the hub and chassis. If it hasn't been done in five years it probably needs to be done. I got a nasty surprise when the supposed correct drivers side hose from amazon turned out to be incorrect. A quick trip to autozone fixed that issue with the correct hose. There was an issue with getting the hardware kit for the drums in the rear. I would up ordering a kit from both amazon and autozone. The are similar but not the same to the hardware that is installed. Getting the new retaining springs installed is a real pain. I had to borrow a nice spring install tool from Ken. If you are looking at buying a tool get one with texture on the inside. If the area is smooth it may not grip the locking pin. Wrong replacement drivers side hose.